"excellent :D will do it again"
"Absolutely brilliant tool once you've mastered the collar tightness. Will do pretty much all 10pin tubular locks, evan if they have different spring strengths. A little bit pricey but is a nice tool to own and use and makes building a working key very easy to do, can't praise UKBUMPKEYS enough!!! fantastic company and fantastic tools." "Very well made rakes and the service was excellent one of the rakes was damaged I reported it and a replacement was shipped immediately thank you Chris and team "
"I can't fault this item. The keys are made of steel which means they are more durable than the cheaper brass alternatives. There is no need to file down the shoulder to accomodate springs and grommets as UKbumpkeys have done this for you. Great product at a great price. Thankyou." 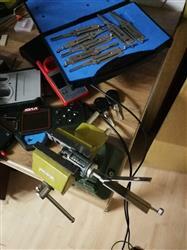 "Bought this as tester to see if lock picking is for me. Gave the James bond set to my 12 year old boy and he Loves it. The 2 locks really help you understand picking & the picks them self aren't but they there great for the money to help you get started. Overall good price and excellent service. " "Good sturdy wrench, very comfortable to use"
"Just a follow up to my early review of the Dangerfield Polaris rake set. Numbering the picks is a stroke of genius. You can now easily remember what number is the optimum number for one of your practice locks. The picks are a delight to use. I had a standard reasonably expensive kit from a recognised manufacturer. That set is barely used now. As you can imagine locks can be opened by more than one pick. The 4 and 5 are probably best suited for slightly bigger locks and the 6 and seven for smaller locks I.e. padlocks etc. Bogotá’s are always handy and the three included are the most useful. . (See also my review of the Multipick Bogotá’s) Playing with these picks for a few days I found the optimum picks for certain locks, then tried out the other picks until I could open most locks with most picks. Taught me a lot about tensions. Chris’s online manual has been incredibly useful. My latest project has to see which one pick can open most of my practise locks. That again taught me a lot about lock raking/picking. Like I said before raking is a lot of fun. " "we have purchased a number of items from UK Bumpkeys and being a professional locksmith,these tools are going to be used on a daily basis and great deal need to last. hence why all of us at www.irongatelocksmiths.co.uk are returning customers. thanks"
"easy use of the tool for nondestructive opening of vehicles anderen save determination of the lock"
"Very pleased. Good quality item at a good price. " "very good, easy to use"
"Very pleased - just what I ordered and needed in quick time ! I like buying from UK Bumpkeys. Kindest regards Owen"
"Amazing rakes, they open locks with ease,and there really well made and very strong these r my favorite rakes "
"Products arrived on time, and the staff answered my emails, even close to christmas"
"Very good quality, fast shipping, thank you seller"
"Very Easy to use. Excellent steel "
"Very pleased - nice doing business with this company." "Really good well thought out set of picks that are a pleasure to pick with. Only downside is not quite deep anothe for multi locks "
"As usual Sparrows Lock Pick are fantastic, really like this Pick Set and would recommend these picks. As usual UKBUMPKEYS service is first class, thank you. Also Amazon!" "great product,at a,decent price,however all my info monetarily speaking is in UK pounds not just on your site.but on paypal as well.can't wait for your new warehouse here across the pond." "I haven't had a chance/opportunity to use it in the field yet, but it seems well built and designed." "Best pick locking site to date, fast shipping perfect customer service!" "Very good steel and perfect spare part"
"As always great service "
"This was a Christmas gift and apparently it's brilliant... thank you"
"Petersons #1 hook is a great tool. It's the 1st choice when initially investigating a lock, slim enough to get into the majority of keyways and strong enough to lift the pins and open many. Like most picks it benefits from a little polishing but that's quite normal. Customer service from UKBK is 1st class, even when there is a little glitch it's sorted without hesitation." "Bought this during an awesome 40% off promotion. Picks are made of fine material, the 0.015" set is useful for more restrictive keyways. Personally I prefer the smaller profile of Sparrows picks but these do make a nice supplement to what I already have." "Really a useful set of rakes. Like having a master key. The finish was a little rough. They could have spent more time in the tumbler. After some smoothing out, they work like a champ. Good job, Chris!"